Make your business better and stronger by leading a healthier, happier workforce. We spend 90% of our time indoors, our buildings are designed to protect us but instead they are getting in the way of our health. 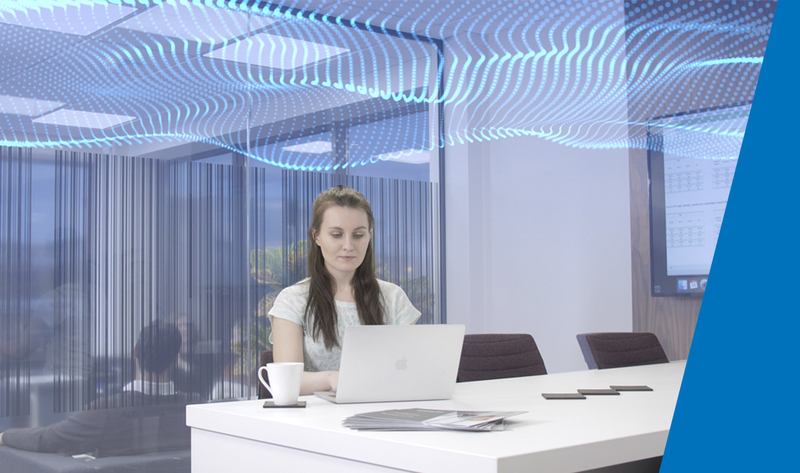 Remark Group combine the gentle nature of Sound Masking with Human Centric Lighting, Digital Skylights and Windows Displays to create a collaborative, productive and healthy workspace. We can create spaces that enhance rather than hinder our health; a healthy building means healthy tenants who in turn are more productive. Reduce conflicting sounds within your workplace with Sound Masking solutions. Encouage productivity and wellbeing with specialist lighting solutions. Create a calming environment with digital displays within your offices. Maintain a comfortable working environment with air quality sensors. Noise, whether it be speech or otherwise, has subtle but profound effects on workers psychologically, behaviourally and cognitively. However, complete silence can be just as distracting as loud environments – as it highlights the sudden disturbances. Sound Masking is an effective method that, when installed correctly, has the potential to bolster acoustical privacy and reduce distracting noises, which in turn helps to improve the overall office comfort. Sound Masking in its raw sound can create a relaxing atmosphere that promotes the overall well-being of office workers. 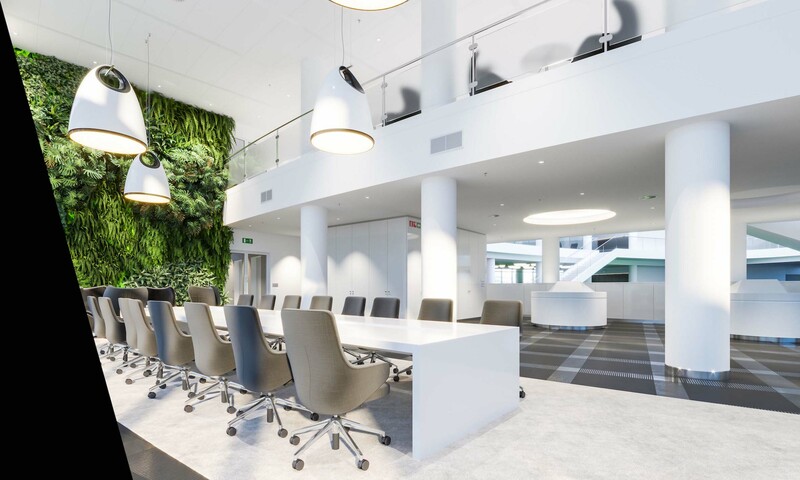 It also has the ability to intertwine with natural sounds, creating a completely immersive and calming environment where employees can focus and collaborate naturally. Human Centric Lighting puts focus on both the visual and non-visual effects of lighting. Not only do people need light to perform visual tasks, but light is also an important ‘time-reference’ for our internal clock. Our bodies react to darkness by creating the hormone known as melatonin which regulates sleep. If there is not enough light, feelings of lethargy will be caused by an excess of the hormone, in turn, reducing productivity and the motivation to complete a work task on time and to a high standard. 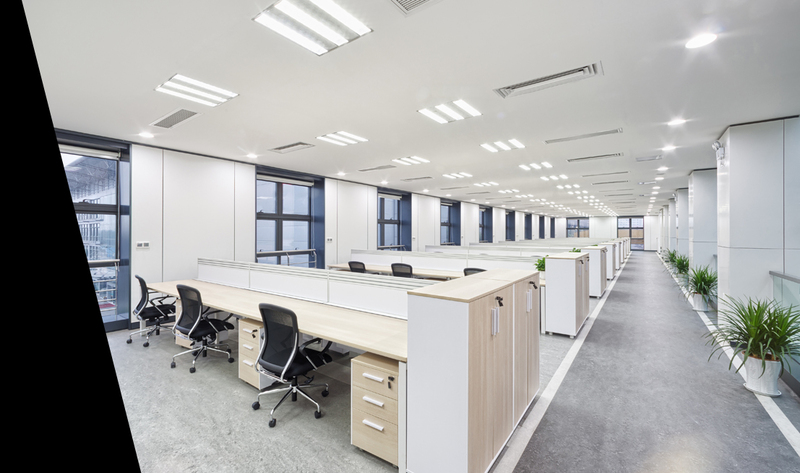 Ideally, lighting in the workplace should encourage productivity in your workforce, and provide a balance of natural and artificial lighting for employees to concentrate to the best of their ability for extended periods of time. Higher motivation increased productivity and an improved sense of wellbeing are just some of the documented effects of Human Centric Lighting. Nature is scientifically proven to be one of the best ways to boost a person’s mood and wellbeing. For those who work in the city or a built-up area, getting to nature can be quite a challenge, particularly during working weeks. So as an employer, why not bring nature to your employees? Digital skylights and windows displaying serene landscapes create a soothing and calming environment, increasing your workforce’s wellbeing. Whether you are creating a designated area for wellbeing or want to promote it throughout your offices, digital displays are a simple but effective way of boosting the wellness of your employees. Digital Displays naturally go hand-in-hand with the calming sound of Sound Masking, creating an immersive and dynamic environment that boosts overall wellness and leaves people feeling motivated and refreshed. Air quality has a huge impact on health and has the potential to affect an individual’s wellbeing, comfort and productivity in the workplace. Issues with air quality may cause headaches, fatigue and eye irritation. CO2 levels above 1,000 create a stuffy atmosphere causing employees to feel lethargic and sleepy and therefore less productive. The cause of high CO2 levels is generally due to poor ventilation and/or circulation within the space. Humidity also has a huge impact on an individual’s productivity. Humidity needs to be within a range of values for the environment to be comfortable. If the levels are too low employees may experience irritation to the skin, eyes, throat and nasal. High humidity levels promote the growth of mould, bacteria and dust mites which can lead to allergies and respiratory inflammation. Air quality sensors can monitor the air on a daily basis, enabling users to maintain a comfortable working environment.